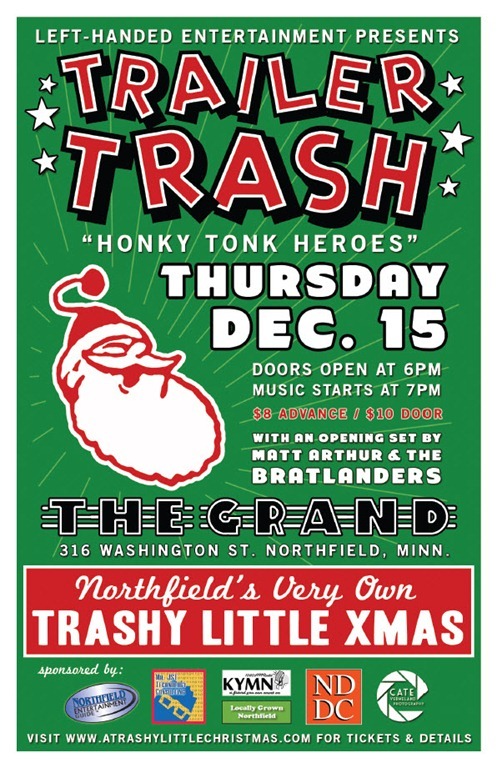 Trailer Trash brings their celebrated holiday show, A Trashy Little Christmas, to the Grand Event Center here in Northfield. Details here. Honky-tonk band Trailer Trash has drawn sell-out crowds for nearly 20 years with its debaucherous “Trashy Little Xmas” show at Lee’s. 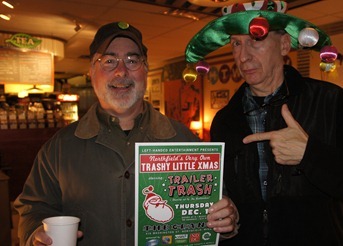 These guys are the real deal — the band’s first collection of Christmas covers, 1996’s “Hell, It’s X-mas,” remains one of the best local holiday albums of all time. For the show, revel in the band’s revamped classic and not-so-classic holiday tunes, from Clarence Carter’s “Backdoor Santa” to Band Aid’s “Do They Know It’s Christmas?” (along with a few originals), and get into the spirit by coming dressed as Santa, Mrs. Claus, or one of their elves. Previous PostMonster Games buys the Jasnoch Construction buildingNext PostHow shrtong do you feel about people who pronounce /str/ as /shtr/ ? The show is tonight. See y’all there! Griff–Few people could get away with wearing that hat. But on you, it works!